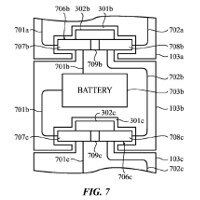 A patent application filed by Apple in February 2015 and titled "Modular functional band links for wearable devices," gives us a clue about how Apple intends to add functions to its intelligent timepiece. Users will be able to purchase these smart modular bands, which would be embedded with the appropriate technology and links, and snap them into the device's diagnostic port. By offering this accessory, Apple won't have to introduce new hardware every time it wants to add certain features to the Apple Watch. Some of the potential features listed on the patent application include additional battery power, a blood pressure monitor and thermometer, GPS module, speakers, a camera, and a module that measures the amount of sweat generated by an Apple Watch wearer. The patent application doesn't reveal when we might see these bands offered to the public. Last month, Apple introduced some new bands for the Apple Watch while lowering the starting price by $50 to $299. I'd like to know why someone would want to measure the amount of sweat that they generate. Innovative idea though. It might have something to do with tweaking the sensor readings. I run with my Gear S2 Classic, as I did with my Fitbit, but I've noticed that the fitbit was way more accurate at estimating my run/walk ratio and distance. The leather band around the Gear S2 creates (or captures) more sweat, and I believe it throws off readings. - Maybe a sweat sensor could fix the discrepancy. This isnt about measuring the amount of sweat but rather checking what is inside your sweat for health benefits. Something like this? http://m.chooseblocks.com/ Once again it's just icopy cats.......They develope nothing themselves, only buying or steeling. Hopefully this kick-starter already has a patent of some kind on the concept. What Apple is about to do, sounds just like this kick-starter. If Apple steals this to get a head-start because they have more money, this kick-starter wont stand a chance. Very good find! If this were an competitor's product, iPhonearena is bound to find a resemblance to an apple product, but vice versa, they just keep shut like it doesn't matter. The Apple Watch was introduced back in late 2014 with these ports. That means that the development of this watch was as far back as 2013 at the earliest. That means Apple had the intention of doing this for years. How the he** do you thing they copied this Kickstarter? http://techcrunch.com/2015/10/13/blocks-kickstarter/ According to this article dated October 2013 it says that Blocks was in development for two years previous to that. Ok cool. Try doing this with every company that comes out with something new. You will be shocked. Don't go get Google happy every time you see a patent by Apple. Also, what proof do you have that Apple copied this. Their have been tumors for sensors and all kinds of stuff for years. I'm not Google happy and I didn't say that Apple copied anything. I corrected your assumption that production for Blocks started around the same time as with the Apple watch. Since when is it being biased to post correct information? And the reason I did it with this product is because I happened to read this article and I remembered that Blocks has been around for longer than 2013. Take some of your own advice. And for your information, I have called out Google for their ripping off Motorola's apps, like Active Display (Moto Display) and Do Not Distrub (Moto Assist). You know these guys cant handle facts, when it paints Apple in a bad setting. Good find. You don't have too say Apple stole the idea. I will. I read the link and I think Apple is using their market strength and cash to make them first because its a good idea. Just like they stole the tech in their heart monitor. Apple will never come out with anything original. Like Jobs claimed Microsoft has no originality in their products, Apple doesn't either. Yeah exactly, if there is the great smart battery case, why not make a great smart battery band ? Wowen nylon would be great. No they have not. Every article is how the OEMS are copying Apple. However I do recall an article where PA compared things we see in iOS that were original on Android and vice versa. They all copy. I don't have a problem is an OEM sees an idea of another and takes it to another evolutionary idea. What I do hate with Apple, is they take those ideas usually stoeln, doesn't give any credit to the originator and pawns it as their own. Example? The kid who made wireless sync for iOS. He offered the app on the App Store and then Apple took it down. So the guy put it up on Cydia where it sold very well. Then on the next iPhone model Apple introduces wireless sync which mysteriously has the exact same icon. http://www.theregister.co.uk/2011/06/08/apple_copies_rejected_app/ Yet these ignorant fans never say anything bad about Apple even when they deserve it and because someone else does you have to be a troll or a hater. Facts are facts whether we like them or not. If this was Samsung the Apple loyalists would be showing all kinds of hates. They are all hypocrites to their very core. Apple has never made a single original produxt. They've borrowed and stole heavily from the industry in general and called it their own. Just like yes they bought the original company that made the Siri app, but then stole the UI from another company. I haven't heard anything about this lawsuit anymore. APPLE probably paid them to keep quiet. http://9to5mac.com/tag/xiao-i-robot/ Even though the video is no longer avail, it had the same UI as Siri and even the exact same icon. Bloomberg and even Forbes wrote about it. All the fans of Apple are just going to end up like Jobs; rotting away. Replaceable bracelet is an old technology. I modeled and posted a smart watch with mini batteries in each link a year and a half ago. I wonder if that would be enough to invalidate their patent. I would certainly freely hand it over to any company that wanted to or needed to try.